A recipe for spiced pear sauce. 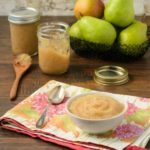 It is similar to applesauce but made with fresh pears and spiced with vanilla, cinnamon, and ginger. Enjoy as a side or snack. Combine all ingredients in a medium saucepan. Bring to a boil over high heat. Loosely cover and reduce heat to medium-low. Simmer until pears have softened, about 30 to 40 minutes. Stir occasionally. Add 1 tablespoon of water if pears seem too try during cooking. Transfer cooked pear mixture to a food processor fitted with a knife blade. Process until smooth or desired texture. Stop and scrap down sides of processor bowl as needed. Spoon into 8-ounce canning jars and wipe rims clean. Seal jars and cool on a wire rack to room temperature. Store in refrigerator and use within 3 weeks. Alternatively, spoon into a non-reactive plastic or glass storage container. Cool to room temperature, cover, and store in the refrigerator. Use within 5 days.